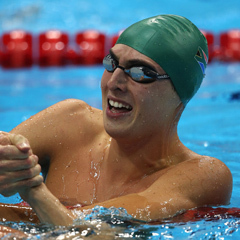 Cape Town - South Africa's Charles Bouwer has finished in fifth position in the men's 400m freestyle S13 final at the London Paralympic Games on Tuesday night. Bouwer finished in a time of 4:14.13. Belarusian sensation Ihar Boki stormed to the gold medal, setting a new world record of 3:58.78 - the first time an athlete has gone under four minutes in this category. Ukraine's Danylo Chufarov won silver in 4:05.85, with Russia's Aleksandr Golintovskii taking bronze in 4:11.13. Earlier on Tuesday Bouwer qualified for the final with a fourth-fastest time of 4:17.74.